Exhibition private view and curator tours 3pm – 6pm, with tea offered at 4pm. 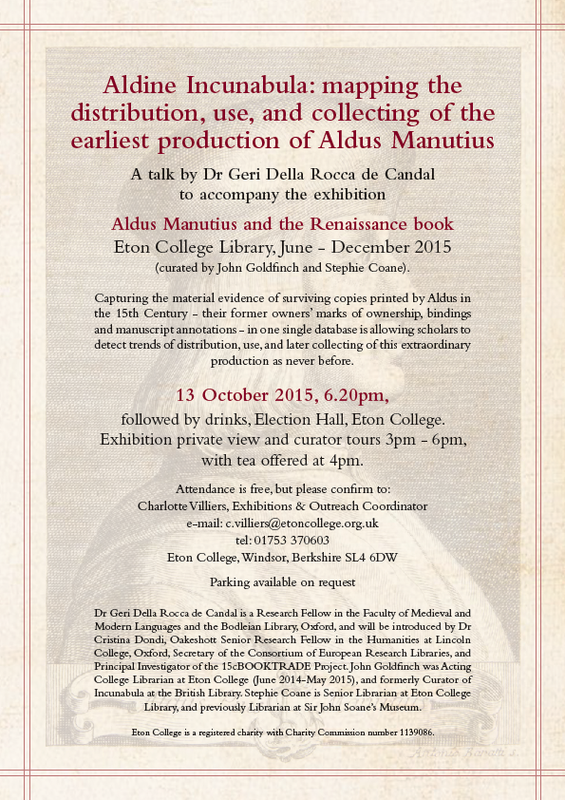 A talk by Dr Geri Della Rocca de Candal to accompany the exhibition “Aldus Manutius and the Renaissance book”, Eton College Library, June – December 2015 (curated by John Goldfinch and Stephie Coane). Capturing the material evidence of surviving copies printed by Aldus in the 15th Century – their former owners’ marks of ownership, bindings and manuscript annotations – in one single database is allowing scholars to detect trends of distribution, use, and later collecting of this extraordinary production as never before. Dr Geri Della Rocca de Candal is a Research Fellow in the Faculty of Medieval and Modern Languages and the Bodleian Library, Oxford, and will be introduced by Dr Cristina Dondi, Oakeshott Senior Research Fellow in the Humanities at Lincoln College, Oxford, Secretary of the Consortium of European Research Libraries, and Principal Investigator of the 15cBOOKTRADE Project. John Goldfinch was Acting College Librarian at Eton College (June 2014-May 2015), and formerly Curator of Incunabula at the British Library. Stephie Coane is Senior Librarian at Eton College Library, and previously Librarian at Sir John Soane’s Museum. Eton College is a registered charity with Charity Commission number 1139086.